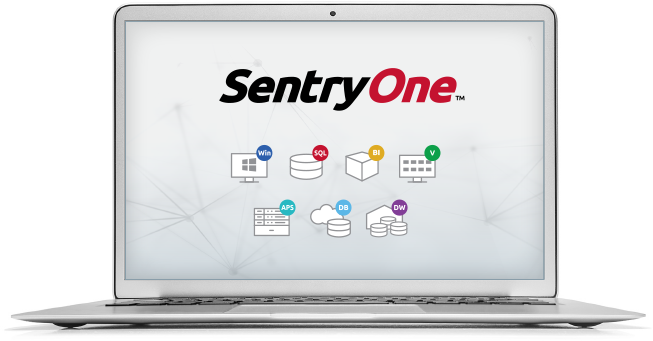 Designed for enterprise-ready scalability, SentryOne empowers you to manage performance across your physical, virtual, and cloud-based environments from a common user interface. What is the SentryOne Platform? SentryOne database performance monitoring allows data professionals to consolidate their toolsets, reduce infrastructure costs, and increase database speed and efficiency. We deliver the confidence to diagnose root causes of performance issues and optimize your entire server environment, regardless of size or complexity. How do I license the Platform? The SentryOne platform empowers you to manage the entire Microsoft data platform, with solutions that support physical, virtual, and cloud environments. Individual products allow you to customize usage and scale as your environment requires. Our strict adherence to engineering for the lowest possible overhead allows us to capture more data points with higher granularity than any other system without becoming the cause of performance issues. 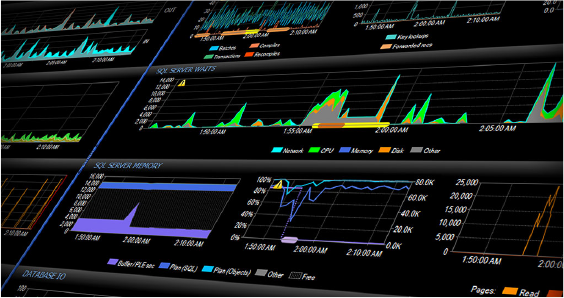 Instantly visualize performance and generate insights across a massive number of servers with ease. Designed to provide contextual relationships between SQL Server and everything that impacts performance. Intuitive analysis workflows let you drill down from dashboards to specific metrics with minimal effort. Quickly pinpoint areas of concern and use the integrated optimization tools to solve problems fast. We’ve gone to great lengths to produce consistent and realistic load tests, and to analyze the stresses that our monitoring can place on CPU, memory, network, and I/O while a typical load is running against a number of monitored SQL Server instances. 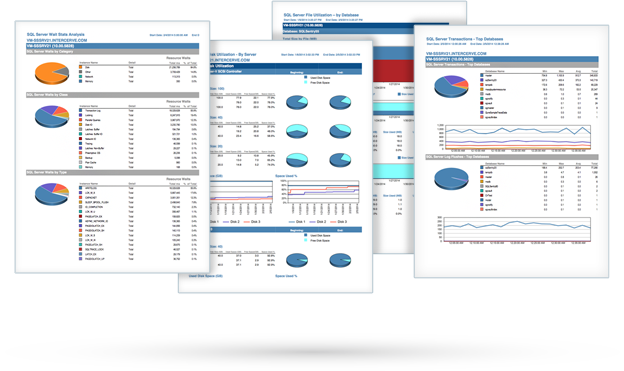 Performance Dashboards display information from a variety of sources. See precisely what is happening at the current time, or switch to history mode and see exactly what was happening at any time in the past. Easily jump to Top SQL, the Event Calendar, Disk Space, and more to determine exactly what was happening when you experienced problems. The SentryOne client is the central application for managing server performance. Access your entire environment from a common user interface with consistent features and functionality. Easily toggle between performance dashboards, event calendars, and query tuning without switching applications. A central monitoring service gathers data from all environments, minimizing potential overhead and providing easy administration. Monitor physical, virtual, and cloud targets for full visibility from a single operating platform. 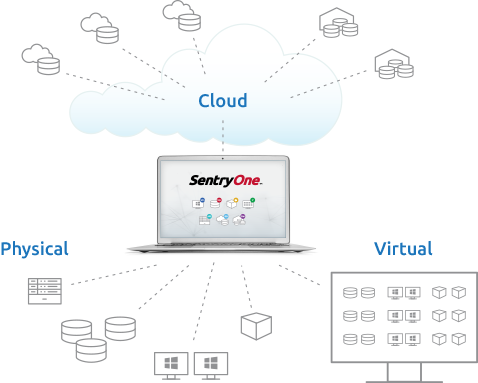 Whether you are running a single SQL Server, have hundreds of servers running in a virtual environment, or have databases or data warehouses in the cloud, SentryOne can scale to support your entire infrastructure. The SentryOne platform delivers extensive performance reporting. Built-in, pre-formatted reports allow you to easily view and share information, and provide easy-to-understand, actionable information. Use the built-in reports from the SentryOne client or publish to your own Microsoft SQL Server Reporting Services (SSRS) server for sharing within your entire organization. Connect and view data from pre-built Power BI dashboards and reports that are updated continuously and automatically. Or synchronize your data to our cloud-based service at cloud.sentryone.com and schedule reports for automatic delivery to anyone. Our built-in alerting provides customizable and flexible definition of conditions and response actions. Whether you want to send individual alerts or notify groups of people, custom alerts are easy to set up. Our advanced Advisory ConditionsTM allow you to build alerts specific to your own monitored environment, using values and metrics retrieved from multiple sources and subsystems. Easily create advanced performance alerting and enhanced change detection via Advisory Conditions. 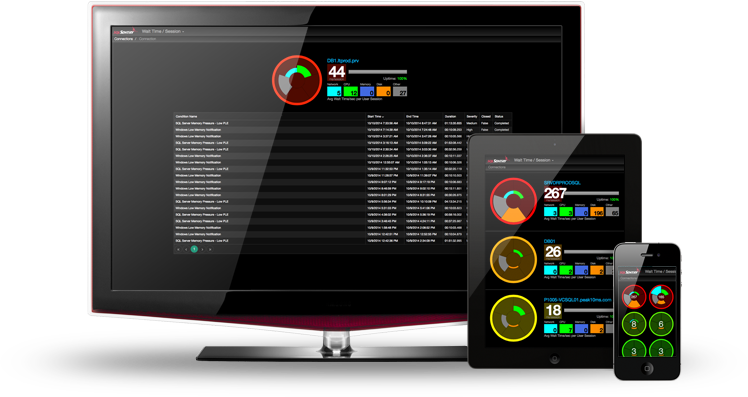 View your performance data from any device, including phones and tablets. 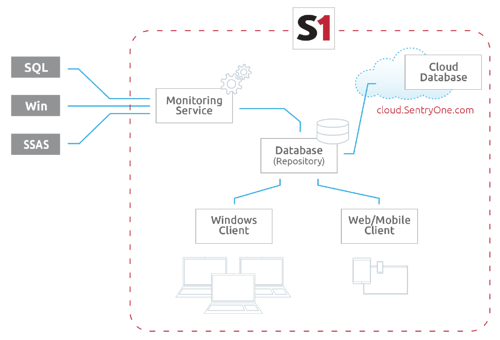 Cloud.sentryone.com enables you to access your performance data from anywhere with many of the same great features found in the SentryOne client. This includes performance dashboards and reporting, plus the innovative Server Health Status view, which delivers an instant picture of the health of your entire environment. Log into your cloud.sentryone.com account here. 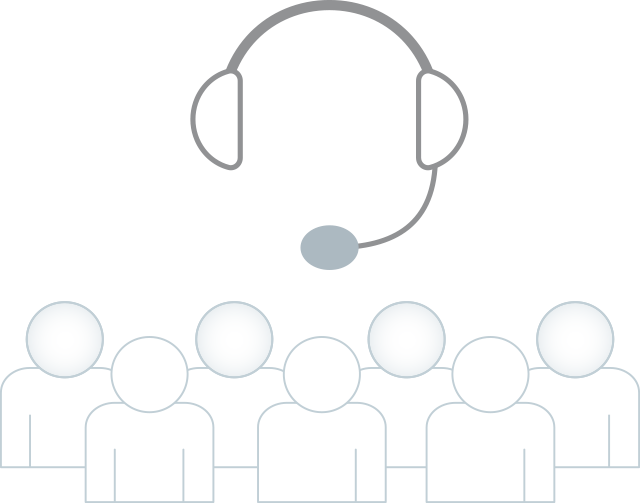 Whether you prefer speaking directly to a human being or you want to troubleshoot on your own, our support team and technical resources enable you to unlock the full potential of SentryOne and be an expert in your role. SentryOne platform products designed for SQL Server, Analysis Services, and Windows Server provide coverage for your entire physical environment. VMware and Hyper-V solutions add support for your virtual environments. Our products for Microsoft APS, Azure SQL Data Warehouse, and Azure SQL Database help you optimize specific environments and cloud-based systems. Everything DBAs need to monitor, diagnose, and optimize SQL Server, plus integrated Plan Explorer, the premier SQL query analysis, and optimization tool. 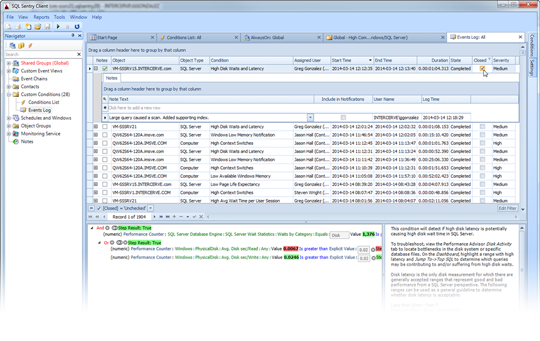 Win Sentry tracks performance for all Windows processes and services. The Hyper-V host dashboard shows how resources are allocated by VM. V Sentry provides VMware admins and DBAs a unique view of resource utilization to analyze network, memory, CPU, and storage performance on VM hosts and VMs. BI Sentry provides insight into SQL Server Analysis Services performance issues related to memory and storage systems, aggregation usage, unoptimized queries, and more. Keeps Azure SQL Databases running at peak efficiency with performance monitoring metrics including DTU usage. Unified solution for performance monitoring of Azure SQL Data Warehouse that provides visibility into impacts on workloads. Performance monitoring for Microsoft Analytics Platform system. Maximize your investment by running at peak performance.